(HONOLULU) – The Department of Land and Natural Resources, Division of Forestry and Wildlife (DOFAW), will close the Manoa Falls Trail next week to conduct a rockfall mitigation survey on August 20, 21, and 22. The survey, conducted by DLNR and AECOM, will assess and document potential hazards within the falls viewing area. This section of trail has historically been the site of landslide events and has documented injuries generated by falling rocks. To eliminate the risk of hiker injury during the survey, the entire Manoa Falls Trail will be closed for each day. Access to the trail will also be closed from Aihualama Trail. All hikers who attempt to enter Manoa Falls Trail via Aihualama Trail will be redirected through a delineated service trail to the Makiki-Tantalus Trail System. Closures will also extend to all commercial tour operators who conduct business on Manoa Falls Trail. Regular trail use will resume on August 23. The Manoa Falls Trail is normally open daily from sunrise to sunset. Admission is free to the public. Parking, provided by Paradise Park, requires a $5.00 fee per car. Commercial tour operators also provide guided tours of the trail during weekday operations. 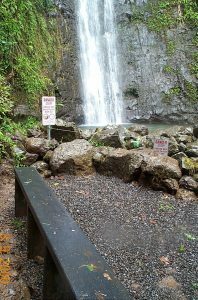 Please remember that any access into the pool area at Manoa Falls is prohibited. Anyone who is found beyond signed, roped, or fenced areas is subject to be ticketed by law enforcement officials on-site.